It's been a whirlwind White Horse release month, and it culminated with a great Artswalk show at Rhythm and Rye. 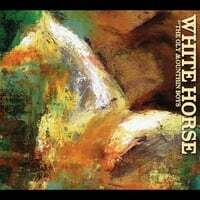 Meanwhile, White Horse reviews are turning up in our hometown South Sound Weekly Volcano and as far off as the UK's Folkwords! More to come! We've got great shows coming up, some in familiar places and some brand new! Like this Friday (November 7th), when we start the night at Cassava in Longview for First Friday Music, and end by closing the show at ol' Rhythm and Rye with The Lowest Pair and The Love and Stress Compound! We're also honored to be a involved in some great happenings in the South Sound community this coming month. For Veteran's Day (November 11th), we'll join the celebration of the 125th anniversary of Washington's statehood at the Washington State Capitol by performing one of Washington's state songs, "Roll on Columbia!" And on November 15th, we get to be part of the opening of the Tacoma Art Museum's "Go West" exhibit! Keep an eye on the shows page for more!